Cluster POWER-Up enables greatly simplified configuration of clusters of bare metal OpenPOWER servers running Linux. It leverages widely used open source tools such as Cobbler, Ansible and Python. Because it relies solely on industry standard protocols such as IPMI and PXE boot, hybrid clusters of OpenPOWER and x86 nodes can readily be supported. Currently Cluster POWER-Up supports Ethernet networking. Cluster POWER-Up can configure simple flat networks for typical HPC environments or more advanced networks with VLANS and bridges for OpenStack environments. Complex heterogenous clusters can be easily deployed using POWER-Up’s interface and node templates. Cluster POWER-Up configures the switches in the cluster with support for multiple switch vendors. Rack and cable the hardware. initialize switches with static IP address, userid and password. insure that all cluster compute nodes are set to obtain a DHCP address on their BMC ports and they are configured to support PXE boot on one of their network adapters. Install the Cluster POWER-Up software on the deployer node. Edit an existing config.yml file to drive the configuration. When finished, Cluster POWER-Up generates a YAML formatted inventory file with detailed information about your cluster nodes. This file can be read by operational management software and used to seed configuration files needed for installing a solution software stack. Cluster POWER-Up supports Cisco, Mellanox and Lenovo switches. Not all functionality is enabled on all switch types. Currently redundant networking (MLAG) is only implemented on Mellanox switches. Port channel support is only implemented on Cisco (NX-OS) and Mellanox switches. POWER-Up can configure any number of node interfaces on cluster nodes. To facilitate installation of higher level software, interfaces can be optionally renamed. Interface templates are used to define network configurations in the config.yml file. These can be physical ports, bonded ports, Linux bridges or VLANS. Interface templates can be entered using Ubuntu or Red Hat network configuration syntax. Once defined, interface templates can be applied to any node template. Node interfaces can optionally be configured with static IP addresses. These can be assigned sequentially or from a list. Cluster POWER-Up supports clusters of heterogeneous compute nodes. Users can define any number of node types by creating templates in a config file. Node templates can include any network templates defined in the network templates section. The combination of node templates and network templates allows great flexibility in building heterogeneous clusters with nodes dedicated to specific purposes. Many other x86 nodes should work, but we have only tested with Lenovo and some Supermicro nodes. 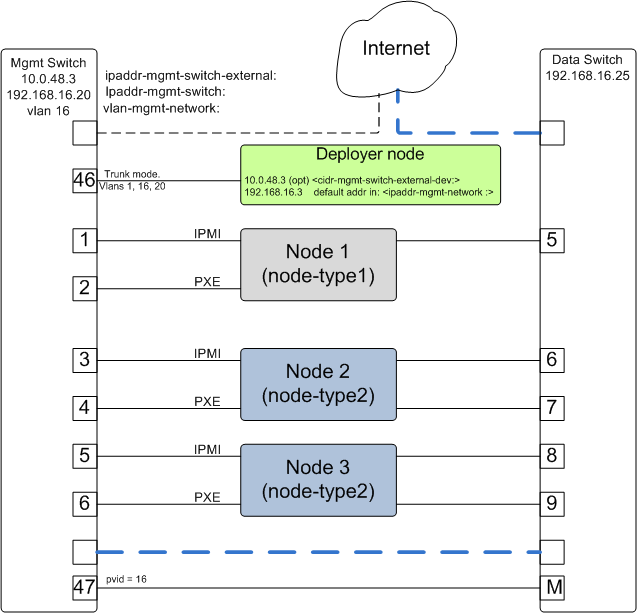 Cable the deployer node directly to a management switch. For large cluster deployments, a 10 Gb connection is recommended. The deployer node must have access to the public internet (or site) network for retrieving software and operating system image files. If the cluster management network does not have external access an alternate connection must be provided, such as the cluster data network. Insure that the BMC ports of all cluster nodes are configured to obtain an IP address via DHCP. Acquire any needed public and or site network addresses. assign static ip address. This must match the corresponding interface ‘ipaddr’ specified in the config.yml file ‘switches: data:’ list, and be in a deployer ‘mgmt’ network. assign netmask. This must match the netmask of the deployer ‘mgmt’ network that will be used to access the management port of the switch. admin password. This must match the password specified in the config.yml corresponding ‘switches: data:’ list item. In order for Cluster POWER-Up to access and configure the switches in your cluster it is necessary to configure management access on all switches and provide management access information in the config.yml file. In this example, the management switch has an in-band management interface. The initial setup requires a management interface on all switches configured to be accessible by the deployer node. The configured ip address must be provided in the ‘interfaces:’ list within each ‘switches: mgmt:’ and ‘switches: data:’ item. Cluster POWER-Up uses this address along with the provided userid and password credentials to access the management switch. Any additional switch ‘interfaces’ will be configured automatically along with deployer ‘mgmt’ networks. This completes normal POWER-Up initial configuration. In passive mode, POWER-Up configures the cluster compute nodes without requiring any management communication with the cluster switches. This facilitates the use of POWER-Up even when the switch hardare is not supported or in cases where the end user does not allow 3rd party access to their switches. When running POWER-Up in passive mode, the user is responsible for configuring the cluster switches. The user must also provide the Cluster POWER-Up software with MAC address tables collected from the cluster switches during the POWER-Up process. For passive mode, the cluster management switch must be fully programmed before beginning cluster POWER-Up, while the data switch should be configured after POWER-Up runs. The port(s) connected to the deployer node must be put in trunk mode with allowed vlans associated with each respective device as defined in the deployer ‘mgmt’ and ‘client’ networks. The ports on the management switch which connect to cluster node BMC ports or PXE interfaces must be in access mode and have their PVID (Native VLAN) set to the respective ‘type: ipmi’ and ‘type: pxe’ ‘vlan’ values set in the ‘deployer client networks’. Configuration of the data switches is dependent on the user requirements. The user / installer is responsible for all configuration. Generally, configuration of the data switches should occur after Cluster POWER-Up completes. In particular, note that it is not usually possible to aquire complete MAC address information once vPC (AKA MLAG or VLAG) has been configured on the data switches. It is recommended that the deployer node have at least one available core of a XEON class processor, 16 GB of memory free and 64 GB available disk space. For larger cluster deployments, additional cores, memory and disk space are recommended. A 4 core XEON class processor with 32 GB memory and 320 GB disk space is generally adequate for installations up to several racks. The deployer node requires internet access. This can be achieved through the interface used for connection to the management switch (assuming the management switch has a connection to the internet) or through another interface. Optionally, assign a static, public ip address to the BMC port to allow external control of the deployer node. POWER-Up sets up a vlan and subnet for it’s access to the switches in the cluster. It is recommended that the deployer be provided with a direct connection to the management switch to simplify the overall setup. If this is not possible, the end user must insure that tagged vlan packets can be communicated between the deployer and the switches in the cluster. An example of the config file parameters used to configure initial access to the switches is given above with POWER-Up setup of the switch management network. For a detailed description of these keys see deployer ‘mgmt’ networks, ‘switches: mgmt:’ and ‘switches: data:’ in the Cluster Configuration File Specification. © Copyright 2017, Ray Harrington. Revision 565b20bd.